Astigmatism is a condition in which the cornea of the eye is asymmetrically curved, causing out-of-focus vision. The image does not focus on the retina in a sharp point. The cause of astigmatism is unknown. It is usually present from birth, and often occurs together with nearsightedness or farsightedness. 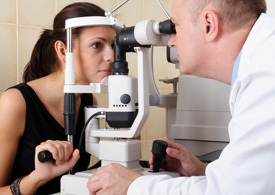 A minor degree of astigmatism is considered normal and does not require correction. Astigmatism is very common.